New York: Cambridge University Press, 2007. 209 pp. $75 ($23.99, paper). Gelvin, professor of Middle Eastern history at the University of California, Los Angeles, has produced an account of the Israel-Palestine conflict which is appallingly shallow, shoddy, and slanted. 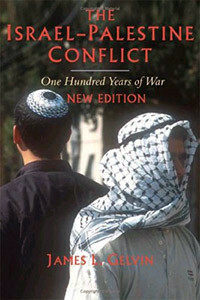 The following excerpt epitomizes the book’s blatant bias:when the Israelis attempted to organize the Palestinians of the occupied territories into collaborating “village leagues” in the early 1980s, the PLO could only react defensively, assassinating those who collaborated. This novel notion of “defensive assassination” characterizes the overriding tenor that pervades Gelvin’s portrayal of the conflict. For it stands to reason that if assassinations by the Palestine Liberation Organization (PLO) are to be denoted “defensive,” they must be in response to an “offensive” of some kind. Presumably then, the offensive that precipitated the defensive assassinations was Israel’s attempt to find collaborating—or should that be “cooperative”—Palestinians with whom it might be possible to reach an agreed modus vivendi against the wishes of the PLO. In other words, Israel’s attempt to enter into dialog with Palestinians other than the PLO constituted aggression that could only be met with defensive fratricide? This sums up Gelvin’s approach to the conflict. Any Israeli measure, however peaceable, is objectionable, meriting censure or even sanction while any Palestinian measure, however brutal, is worthy of understanding, even support. This bias in Gelvin’s presentation of events runs throughout his book. Typically, he glosses over the gruesome details of Palestinian terror and, in dwelling on the Israeli responses, he gives the impression that these responses were unprovoked acts of callous cynicism and cunning. Thus, in describing Ariel Sharon’s decision to launch “Operation Defensive Shield” in 2002, Gelvin neglects to point out that this was preceded by a wave of murderous Palestinian terror, culminating in the horror of the Park Hotel Passover massacre. Was it ignorance, shoddy research, or purposeful design that caused him to omit any mention of the incident, which was a seminal event in shaping public consciousness in Israel and in precipitating the demand for tougher measures against the Palestinian terror? Gelvin leads the reader to believe that it was more the post-9/11 climate in Washington than Palestinian terror and the public mood in Israel that enabled Sharon to undertake the wide-ranging response against the terror organizations in the West Bank. The reader is thus left with the thinly disguised implication that the Bush administration’s war on terror provided the opportunity for Sharon to unleash with glee the Israel Defense Forces (IDF) on the Palestinians. This severely distorted version of events totally ignores the fact that for close to a year Sharon had resolutely refused to undertake any retaliatory measures against the Palestinians despite mounting public pressure to respond to continuing terror atrocities; he doggedly adhered to his policy of “restraint is strength.” Then came the carnage at the Park Hotel in which thirty Jews were killed while attending a Passover meal, making further restraint untenable. But perhaps the feature of Gelvin’s book that deserves particular note is the almost total absence of references. He makes far-reaching claims about contested events without providing source materials to indicate the basis for these claims. Virtually the only references are to obscure anecdotal texts or Palestinian poems, which Gelvin employs in an attempt to authenticate some of his creative versions of historical events. This lack of referencing is a grave defect for what is allegedly an academic endeavor. Thus for example, Gelvin repeatedly accuses Israel of depriving the Palestinians of water, as well as of devastating their agriculture and degrading their infrastructures. These claims are grossly at odds with the facts. Gelvin’s accusation that Israelis living on the West Bank “siphoned off scarce water resources to nourish lawns and fill swimming pools” ignores the fact that the Israel Water Authority conveys more water from pre-1967 Israel into the territories than the Israeli settlements located there use. There is thus an overall net inflow of water from Israel to the Palestinians. While it is true that on a per capita basis the consumption of water by Israelis is much higher than that of the Palestinian population, this is principally a result of differences in demand (rather than supply) and is due to differences in lifestyles. Similarly different rates of consumption occur between the Jewish and Arab populations within pre-1967 Israel—and between different socioeconomic groups within the Jewish population—without anyone raising the claim that this is the result of purposeful deprivation. With regard to stoppages (which also regularly occur in Arab capitals such as Amman and Damascus), these are almost exclusively initiated by Palestinian providers—which are the entities supplied by the Israeli water utility, and which deliver the water to the final consumers. Typically these stoppages are due to theft, poor infrastructure maintenance, or unpaid bills. With regard to urban usage, the Palestinian household consumption of water rose dramatically under Israeli rule—by almost 600 percent from 1967 to 1989, a significantly higher rate of increase than in Israel where domestic consumption in the same period rose by approximately 230 percent. Total freshwater consumption by the Palestinians rose by 300 percent in the period 1967-2006—from 60 to 180 million cubic meter (mcm)—while Israeli freshwater use actually declined from 1,411 to 1,211 mcm in the same period—a decrease made possible by an increased use of recycled sewage for agriculture and desalinated water for domestic use. The Israeli occupation changed local agriculture profoundly. It introduced modern technology, including mechanization, precision tillage, pest control, plastic covering of crops for temperature control, high yielding varieties, postharvest processing of produce, marketing, and export outlets. It also introduced efficient methods of irrigation, including sprinkler and especially drip irrigation. Consequently, output increased greatly, and farming was transformed from a subsistence enterprise to a commercial industry. Devastated Palestinian agriculture? It would seem that Gelvin has gotten it wrong—even backwards. For he further claims that “Israeli investment policy … wreaked havoc on [Palestinian] infrastructure.” This may cause one to wonder what infrastructure he refers to here since in the pre-1967 West Bank—because of purposeful Jordanian policy—there was very little modern infrastructure upon which to wreak any havoc at all. Indeed, Gelvin’s allegation sits uneasily with the fact that out of the roughly 450 towns and villages in Judea and Samaria only 50 were connected to a running water system in June 1967, whereas the number rose to 260 by October 1991. Likewise, Israel extended its electrical grid to supply the Palestinians, as Gelvin himself observes. However, even this he finds a matter for reproach since to his mind this is a merely another instrument of Israeli control over the Palestinians. Thus, Israel is damned if it does and damned if it doesn’t. Indeed, this querulous attitude is difficult to fathom. For if peaceful coexistence between Israel and the Palestinians is feasible, surely such shared infrastructures could only bolster stability. And in light of Israel’s clear advantage in both scale and technology, it would seem only logical that it should supply the Palestinians (rather than the other way round) to allow them to benefit from the economy of scale and enjoy cheaper rates and greater reliability of supply. On the other hand, if such peaceful coexistence is not feasible, is Gelvin suggesting that Israel should facilitate independent power generation in a hostile entity to drive the lathes that fabricate the weapons that would be used against it? But perhaps more disconcerting than the baseless nonsense that comprises the content of Gelvin’s book is the fact that a prestigious academic press such as Cambridge University Press published it. Quite apart from the questionable veracity of many of the positions expounded; quite apart from the fact that many of these positions would be hotly disputed by many mainstream authorities; quite apart from the fact that such dissenting opinions are not even mentioned, never mind debated, it is the virtually total absence of any references substantiating these positions that makes the book closer to a work of fiction than to a serious academic study. In the final analysis, however, this book should be read, not in spite of all it faults but because of them. For although it is unlikely to contribute in any way to an enhanced understanding of the Israel-Palestine conflict, it will certainly underscore the mendacious manner in which this topic is dealt with in mainstream academe.